We are happy to introduce a new feature allowing Omniscope Mobile users (those viewing tabs in their device's own browsers) to download or print the hosted IOK file exactly as seen in their device's (including tablet devices) own browser. Download as PDF, the server will generate and send to client a PDF file containing all the IOK file tabs captured as high quality images page by page. Print..., the server will generate a printable HTML report, made of all IOK file tabs high-quality images, that will automatically prompt the end-user native browser print dialog. 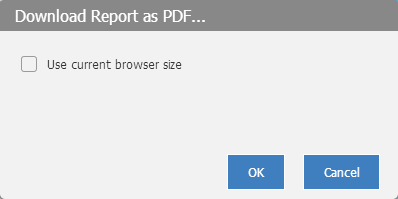 Ticking Use current browser size will generate a report that follows exactly the same app proportions (e.g. views, filters) as seen by the user in their browser. Unticking the option will produce a A4 friendly landscape format report, in which the app proportion will be adapted to the A4 ratio. For instance, iPad users may want to download a PDF that looks exactly the way they are experiencing Server-hosted Omniscope IOK files from inside their iPad browsers by using the Use current browser size option and the result will be something similar to the attached PDF.